Wolverhampton Wanderers are set to take on Burnley at Turf Moor on Saturday evening. Wolves have been flying in the Premier League and currently sit in seventh following their promotion from the Championship last season. Burnley, on the other hand, are not doing nearly as well as they had hoped following their excellent 2018/18 campaign and sit just two points above the relegation zone in 17th. Check out 90min's preview of the Premier League match between Burnley and Wolves at Turf Moor on Saturday. Burnley are awaiting news on an injury sustained to Johann Berg Gudmundsson during international duty with Iceland. The Clarets midfielder was withdrawn late into Iceland's first match of Euro 2020 qualifying and did not feature in their 4-0 defeat to France on Monday. Burnley are also expected to miss Aaron Lennon and Steven Defour who have been out for an extended period of time with knee and calf problems respectively. The Wanderers will be without Ryan Bennett who is currently serving a two-match suspension after receiving his tenth booking of the season in Wolves' 2-0 win over Cardiff City. The squad have no new injury updates following the international window. 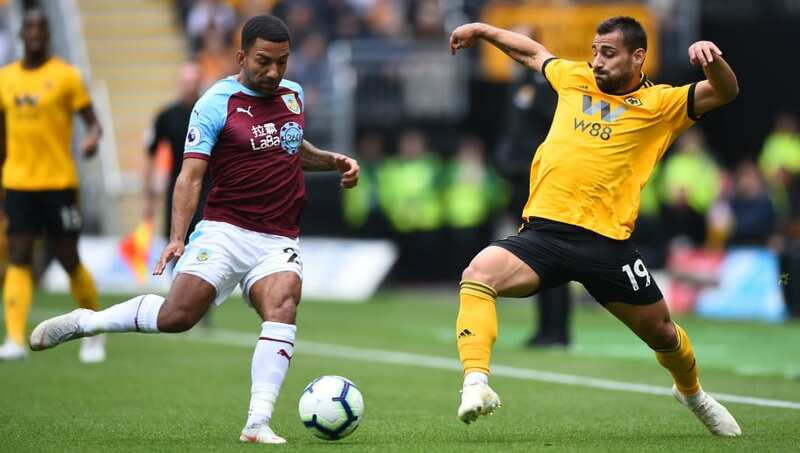 Burnley and Wolverhampton have faced off 129 times throughout their history, dating back to their first matchup in September of 1888. Wolves hold the lead in the head-to-head record between the squads with 66 wins. In the other matches between the sides, the Clarets have won 37 times and there have been 26 draws. When the sides faced off for the first time in the Premier League in September, Wolves took home a 1-0 win courtesy of a Raul Jimenez goal in the 61st minute. Wolves are coming off a big FA Cup win against Manchester United which sent them to the semi-finals of the competition. The Wanderers have only lost one time in their previous 12 matches with a 1-0 loss to bottom feeders Huddersfield being the only blunder since mid-January. Burnley will be looking to break a streak of four straight defeats and have not won a match since they beat Tottenham 2-1 at the end of February. Three points from this match would be a big boost in the Clarets' hopes of staying in the Premier League for another season. Here's how each team has fared in their previous five fixtures. Although it does not look likely Wolves will be able to catch any of the current top six, the players are still going to fight for a spot in Europe next season. This match against Burnley will be a fixture the squad believes they can take all three points from and climb a bit closer to a spot in next season's Europa League. Burnley haven't been able to slow down many teams during their recent run of matches and Wolves have a few players in fine goalscoring form. Expect it to be a hard-fought match, but Wolves should get the best of Burnley's shaky defence and capitalise on any mistakes they may make.